The third volume in our annual commemorative series on aspect of the Irish Revolution. (ii) the impact of the Irish revolution beyond Ireland, focusing particularly on the diaspora and wider imperial and comparative contexts. 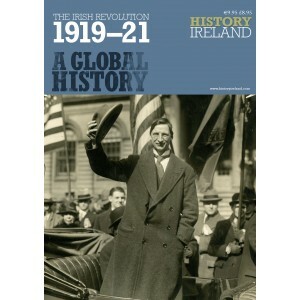 What does a global history offer that we do not already have in many accomplished histories of Irish revolution? In the first instance, there is the much-needed perspective afforded by standing back from events in Ireland to understand the wider context of post-war Europe, and equally Ireland’s place in the newly-reconfigured western world where empires were now in irreversible decline. Widening the focus from the history of the Irish overseas to the global significance of the ‘Irish question’ enables us to chart how extensively the conflict in Ireland was debated across the world in anti-imperial, labour, suffragist, dominion and other circles. Such an approach offers a way of broadening out consideration of the global dimensions of the Irish revolution beyond the involvement of the diaspora in activities such as fund-raising. Nevertheless there is no doubt but that the effort to raise funds from the global Irish diaspora was crucial in financing the Irish revolution. What also emerges clearly is how transnational communications, primarily newspapers and the telegraph, fundamentally shaped how the Irish revolution was reported and written about. The digitisation of newspapers now allows for this story to be told from many different places. Finally, and most importantly, the growth in digital archives such as the 1911 Irish Census of Population, the Bureau of Military History and the Military Service Pensions Collection enables people, wherever they happen to be located in the world, to explore in unprecedented detail the fascinating and rich history of Ireland’s global revolution. To be published: 1 April 2019. Whenever we walk down O’Connell Street or any of Dublin’s streets it’s tempting to wonder just what ..
'A Terrible Beauty' is a feature length docudrama on DVD that offers a fresh approach to the s..
At noon on Easter Monday, 24 April 1916, approximately 1000 men and women stormed buildings in centr..
Roger Casement, executed in 1916 for his part in Ireland’s Easter Rising, remains a controversial fi..